Eastleigh came from behind to beat Welling and continue their encouraging start to the Conference season. Malachi Hudson gave the visitors a first-half lead, firing a left-footed shot into the bottom corner. 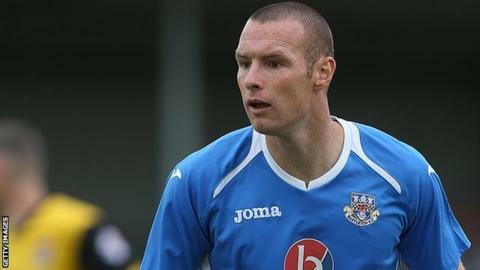 James Constable equalised when he reacted quickest after Jai Reason's free-kick hit the post to tap in his first Eastleigh goal. The former Oxford striker's header then completed the turnaround and Will Evans' late strike confirmed victory. The result lifted the Spitfires into the play-off places, with 10 points from their five games so far, while Welling are 22nd. Match ends, Eastleigh 3, Welling United 1. Second Half ends, Eastleigh 3, Welling United 1. Attempt saved. Ben Wright (Eastleigh) right footed shot from the left side of the box is saved. Attempt missed. Ben Wright (Eastleigh) left footed shot from outside the box misses to the right. Offside, Eastleigh. Ben Wright tries a through ball, but Ben Wright is caught offside. Jake Gallagher (Welling United) is shown the yellow card for a bad foul. Goal! Eastleigh 3, Welling United 1. Will Evans (Eastleigh) right footed shot from the right side of the box to the top right corner. Attempt missed. Jon Nouble (Welling United) right footed shot from the right side of the box is too high. Loui Fazackerley (Welling United) wins a free kick. Substitution, Welling United. Charlie Gorman replaces Sam Corne. Substitution, Welling United. Jon Nouble replaces Malachi Hudson. Foul by Jamie Collins (Eastleigh). Harry Beautyman (Welling United) wins a free kick. Substitution, Eastleigh. Craig McAllister replaces James Constable. Jamie Collins (Eastleigh) is shown the yellow card for a bad foul. Kieron St Aimie (Welling United) wins a free kick. Substitution, Welling United. Afolabi Obafemi replaces Tyrone Marsh. Attempt missed. Paul Reid (Eastleigh) header from a difficult angle on the left is too high. Assisted by Matt Fry. Attempt saved. Jai Reason (Eastleigh) left footed shot from the left side of the box is saved. Attempt missed. Tyrone Marsh (Welling United) right footed shot from outside the box is too high. Attempt saved. Chris Bush (Welling United) right footed shot from the right side of the six yard box is saved. Assisted by Harry Beautyman. Goal! Eastleigh 2, Welling United 1. James Constable (Eastleigh) header from the centre of the box to the bottom right corner. Assisted by Jai Reason with a cross. Second Half begins Eastleigh 1, Welling United 1. First Half ends, Eastleigh 1, Welling United 1. Foul by Matt Fry (Eastleigh).